Bottles, Strollers, Toys, and All Things Baby! Not that we're looking for ourselves (yet), but it seems like the Leebruss ABC Zoom Twin Stroller is not available in the States (let me know if you know otherwise). So I've done a little research and discovered that there's a small range of other truly awesome double strollers that have the option of having the two kids inward facing. 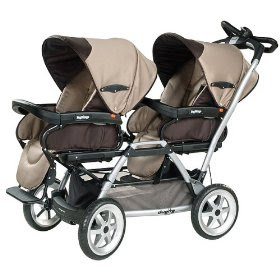 On the more expensive end are two Peg Peregos: The Peg Perego Duette Stroller (about $890) and the Peg Perego Tender Twin Stroller (about $575). On the less expensive end of the spectrum is the Eddie Bauer Bryant Two-Way Tandem Stroller (about $180) and the Kolcraft Contours Options Tandem Plus Stroller (about $220). Our aim is to offer readers an honest, down-to-earth look at popular baby products. If you have questions about baby things, please feel free to email us at questions@babythingsiwant.com. 'Like' Baby Things I Want on Facebook!